Start a new drawing using the acad.dwt (or acadlt.dwt) template. Click the Polyline button on the Draw panel of the Ribbon, or type PL at the command line and press Enter. AutoCAD starts the PLine command and prompts you to specify a start point. Specify the starting point by clicking a point or typing coordinates. Now you truly need to read the command line because the Dynamic Input tooltip at the cursor doesn’t display any of the options. You can right-click or press the down-arrow key to see a list of the options at the cursor, but it’s usually faster to use the command line. Specify additional points by clicking or typing. Pick several more points and note the line width of the new segments. You just created a cool arrowhead! 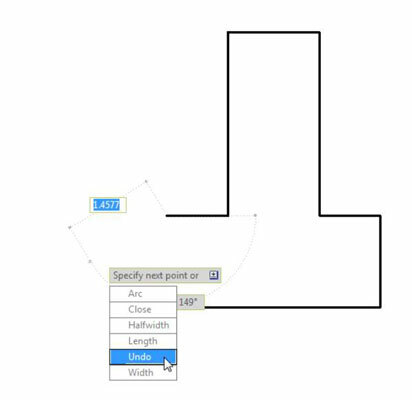 Any time AutoCAD prompts for a length or distance, you can either type a value or “show” it what you want, by picking two points. After you finish drawing segments, press Enter to leave the figure open or type C and press Enter to close it back to the start. AutoCAD draws the final segment and miters all the corners perfectly. After you create a polyline, you can adjust its segments by grip-editing any of the vertex points. Curved segments in polylines are circular arcs that you can draw using the AutoCAD Arc command. AutoCAD can draw other kinds of curves, including ellipses and splines, but not within the PLine command. Repeat Steps 1–5 in the preceding step list. To add one or more arc segments, type A and then press Enter to select the Arc option. Specify the endpoint of the arc by clicking a point or typing coordinates. AutoCAD draws the curved segment of the polyline. The prompts continue to show arc segment options. Specify additional points to draw more arc segments. Choose another arc-drawing method, such as Center or Second pt. Return to drawing straight-line segments with the Line option. In this example, you draw straight-line segments. Perhaps the most useful of the alternative arc-drawing methods is Second pt. It gives you more control over the direction of the arc but at the cost of losing tangency of adjacent segments. If you want both ends of the arc segments to be tangent to the adjacent line segments, you should generally draw the polyline as straight-line segments and then use the Fillet command to add the arcs later. Type L and then press Enter to select the Line option. The prompt reverts to showing straight-line segment options. After you’re finished drawing segments, either press Enter or type C and press Enter. 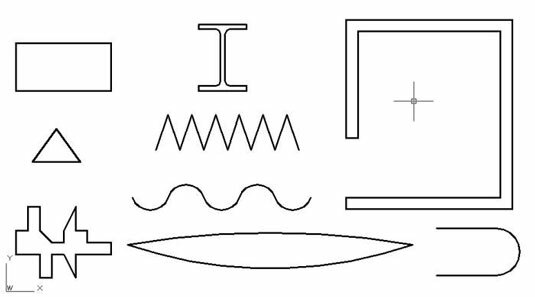 Here are some elements you can draw with the PLine command by using straight segments, arc segments, varying-width segments, or a combination of all of them.